HVGC-650 series can operate with single phase input or one phase distributed from three phase input, which is a great advantage to industrial environment lighting or horticultural lighting application. Furthermore, HVGC-650 series adopts constant power mode design and reaching high efficiency up to 95.5%. 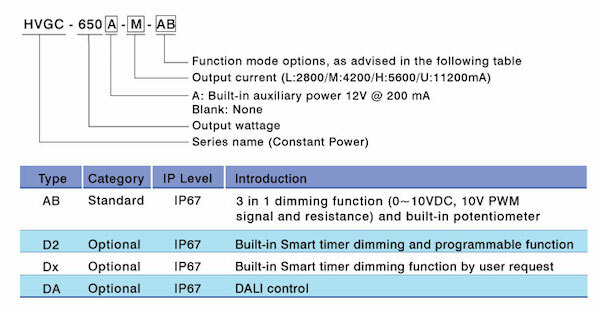 Others include high surge protection withstanding 8kV(L/N-FG)/ 4KV(L-N), wide working temperature range (-40℃~90℃), and auxiliary power 12v @200 mA (optional) for dimming with 3 in 1 or DALI control to achieve IoT control.  IP67 waterproof /dustproof design.